Of the three storylines that spin out of New Krypton -- those of Mon-El, Nightwing and Flamebird, and Superman on New Krypton -- I looked forward to the "New Krypton" thread least of all. I should have had more faith. Writers James Robinson and Greg Rucka, two of my favorites, may have taken the Man of Steel out of his own titles and into World of New Krypton in New Krypton, Volume 3, but our hero remains no less super. In fact, this volume is a wildly effective treatise on what makes Superman the greatest of all heroes, as well as marking one of the first times I feel I've understood General Zod as a worthy opponent for the Man of Steel. Robinson and Rucka don't cover new ground in a story where an adopted alien (Superman, in our case), returns to his people to show them a better way of life, and even the social problems that stem from New Krypton's paranoia and caste system aren't necessarily original. 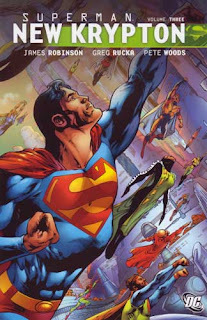 But, rather than lose something as I expected in removing Superman from Metropolis and placing him on New Krypton, they're able to distill Superman to his core elements -- there's no Lois or Lex or even the benefit of a unique set of powers; instead, Superman differs from his fellow Kryptonians by his values. I had hoped, and it seems likely at one point in this story, that Superman might not throw a punch the entire time; this is not to be, but most certainly Superman comes across as a pacifist. On three occasions, Superman resists Kryptonian orders to use lethal force to stop criminals or rampaging beats; on two of those occasions, he handles the conflict through creative use of his powers or simply by talking out the situation, without ever having to resort to violence. In this way, Superman is not Batman, and Superman is not Wonder Woman, and it has nothing to do with rocketing to Earth in a spaceship; Robinson and Rucka demonstrate clearly here that Clark Kent is Superman because he's the world's greatest example of the right choices. The Superman character has been accused at times of, for such a powerful character, having relatively mundane mortal enemies who fight him mentally rather than physically; James Robinson's Atlas was an answer to this, as was Doomsday, though the later's challenge was mostly only physical. General Zod might once have been an adequate Superman villain, but post-Crisis on Infinite Earths Superman had to execute Zod twenty-two issues into the series; a real long-standing Zod wasn't seen again in the Super-titles for about twenty years. I enjoyed Geoff Johns' Superman: Last Son, a precursor to New Krypton that introduced this Zod; but, even despite Johns' revelation that this Zod tried to save Krypton from destruction, Zod still came off as stereotypically world-conquering and one-sided; a physical challenge for Superman rather than an intellectual one. However, when I pick up a book by Greg Rucka, I expect a certain amount of politics and intrigue, and the third New Krypton book doesn't disappoint. Here not only do Zod and his Kryptonian military have all of Superman's powers, but Zod possesses a keen Machiavellian intellect, and he and Superman match wits throughout the book; indeed Zod here reminds me of the best of John Byrne's businessman Lex Luthor, striking at Superman through almost invisible machinations. Robinson and Rucka use no narration boxes (what used to be called "thought balloons") in the story, so the reader is constantly, pleasantly challenged to intuit -- as when Zod puts Superman on trial for treason -- what example Superman might try to set when he accepts his punishment, or what evil reason lies behind Zod's supposed leniancy. In removing some of the world-conquering aspect from Zod (at least for now), the writers reveal a wise and worthy villain, representing vengeance in the face of Superman's calm; it makes the scenes where Superman and Zod fight, and also those rare moments they find themselves in agreement, all the more chilling. I'd be remiss if I didn't mention the art in this volume by Pete Woods. I first encountered Woods' art on Robin, and it was sufficiently cartoon-y for the teen hero's adventures; ditto for the widescreen madcap superheroics in Joker's Last Laugh. I had already noticed a sharpening to Woods' art in Amazons Attack, but in this third volume of New Krypton there's an extra level of sophistication. It's not just his striking images of the various castes on Krypton (reflecting, cleverly on the writers' part, various incarnations of Krypton we've seen over the years), but also the moody, shadowy drama of the aforementioned trial scene. It's a shame DC Comics insists on sticking cover images between the chapters of its collections; not only does interrupt the reading experience in the way a trade-waiter doesn't want, but spoils the illusion of a beautiful, well-deserved graphic novel by Woods. I have on one hand enjoyed how complicated the New Krypton storyline has been, with all the different warring factions, and on the other hand felt some aspects -- like General Lane's constant posturing -- have become a tad worn out. In taking Superman out of Metropolis, the third New Krypton volume can focus solely on Superman's conflict with General Zod, without (much) interruption from the other plotlines. This creates a far clearer and straightforward story (though still with plenty of twists and turns) than New Krypton has seen so far, and to some extent a reader could pick up this book without having read the other parts of New Krypton and still get an enjoyable story (though, that this is dubbed "volume three" makes that occurance somewhat unlikely). I had thought that New Krypton, Volume Three, would be the weakest of the New Krypton books, despite Superman's presence; in fact, it's turned out to be one of the strongest. We'll start to delve into the "Batman Reborn" storyline coming up next. Don't miss it! To those looking forward to the "paperback" version for this collection, I'm just want to stay: it's going to be awhile. I actually like having the covers in between each issue in the trade; I tend to read one issue at a time within the book, so having the covers there make for a natural break point in the story. I find when the covers are at the back, I'll flick back there to look at it before I read the "chapter." Also, it annoys me when there's no cover in between and one issue ends on a cliffhanger and the next issue starts on the next page, ruining the cliffhanger affect; the cover acts as a buffer so I can lay the book down and feel the cliffhanger effect until I pick it up again a day or so later. This is my favorite volume out of the new krypton series by far. I enjoyed how they took Clark's character into play and created tension with Zod. But contrary to one of the remarks in the review, I was glad that Clark threw a few punches, taking out the brute Non and the arrogant Gor. It was nice to see a Superman trade that used a complex, smart story and wasn't about aimless fighting.